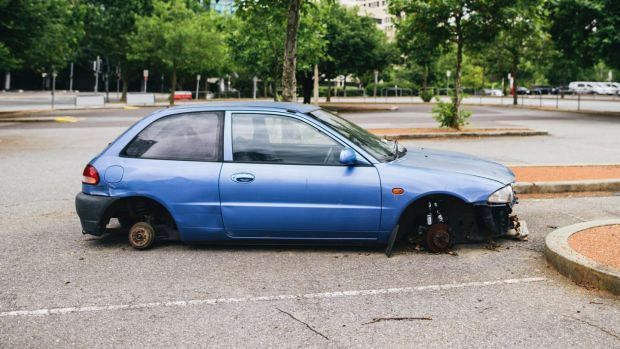 Brisbane residents made more than 18,000 reports of suspected abandoned vehicles in the past three years but most of the claims were inaccurate. From July 1, 2014, to June 30, 2017, the Brisbane City Council received 18,403 reports of abandoned vehicles, of which only 2389 were legitimately abandoned. When vehicles are registered, parked legally and not creating a safety hazard they are not considered abandoned. The council's community services chairman, Matthew Bourke, said of the thousands of reports received by the council each year, many vehicles were reported multiple times. "However, not all of these reported vehicles turn out to be abandoned, which is why council must follow legal procedures and investigate all avenues before the vehicle can be removed from the roadway," Cr Bourke said. The process to determine if a vehicle is abandoned can take up to six weeks. To determine if a vehicle is legitimately abandoned, the council places a bright yellow sticker on it to notify the community. Cr Bourke said the sticker notification allowed the vehicle owner to contact the council if the vehicle had mistakenly been reported and also identified to other individuals that the vehicle had been reported. "Notification occurs after council has exhausted other avenues of identifying and contacting the registered owner using information provided by the Department of Transport and Main Roads," he said. The council's website states it is an offence to leave a car, truck or motorbike on a public road or footpath once the registration has expired. Vehicles with expired registration should be kept on private property. Similar to Brisbane Airport Corporation, which recently publicly listed 17 vehicles as abandoned and to be auctioned or sold to scrap yards, the council too auctions off the abandoned vehicles 14 days after public notice. There are 27 vehicles listed to be auctioned off by the council on August 23, while a further 24 are listed via a public notice as confiscated. Confiscated vehicles have 14 days to be claimed by their owner who, once the claim is made, would have 28 days to provide a proof of ownership, photo identification and pay an application release fee to get the vehicle back. Brisbane residents can report abandoned vehicles online.